for walnuts, or both. For fresh-baked cookies on the fly, cover and chill the dough for up to 1 week, let the dough soften at room temperature for an hour, then scoop and bake. Cookies from dough that has been chilled bake up extra thick and chewy, while freshly made dough results in thinner cookies with crispier edges. 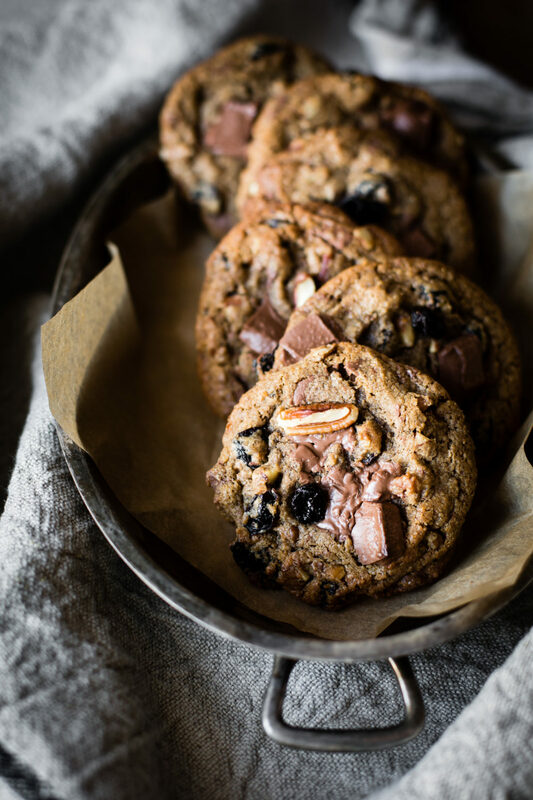 Note: Try Calleris chestnut flour, which is darker and has an assertive, smoky flavor; if the cookies seem to spread too much during baking, add 2 tablespoons gluten-free oat flour to the batter and/or chill the batter until firmer, at least 30 minutes or up to 1 week, before baking. If you use light-colored chestnut flour, such as from Ladd Hill Orchards, increase the chestnut flour to 1 cup. Cooled cookies can be stored in an airtight container for up to 3 days. Position racks in the upper and lower thirds of the oven and preheat to 375ºF. Line two rimless baking sheets with parchment paper. Spread the pecans on a small, rimmed baking sheet and toast until fragrant and slightly darkened in color, 8 to 10 minutes. Remove and let cool completely, then break into quarters. Meanwhile, melt the butter and vanilla bean pod and seeds in a small, heavy-bottomed saucepan over medium heat. Continue to cook, swirling occasionally, until the butter turns golden and smells nutty, 3 to 5 minutes. Place the sugars in a large bowl and when the butter has browned, scrape it and any browned bits into the sugars immediately to stop the cooking. Let cool, stirring occasionally, about 10 minutes. Remove the vanilla pod and discard. Meanwhile, sift together the chestnut and tapioca flours, baking soda, and salt into a bowl. Set aside. When the sugar mixture has cooled to warm, beat in the egg until well combined. Using a wooden spoon, stir the flour mixture into the sugar mixture until well combined, then continue to stir vigorously for a few more seconds; the mixture will firm up slightly. Stir in the pecans, chopped chocolate, and cherries until evenly distributed. If the dough is soft, let it sit at room temperature or in the refrigerator to firm up a bit, 15 to 30 minutes. Scoop the dough into 11/2-inch diameter balls (about 3 tablespoons each; a size 24 or 30 spring-loaded ice cream scoop makes this a snap) and place them 2 inches apart on the prepared baking sheets. Bake the cookies until the edges are golden and set and the tops are pale golden but still soft and underbaked, 8 to 12 minutes, rotating back to front and top to bottom after 6 minutes for even baking. Let cool on the pans for a minute, then transfer them by the parchment onto cooling racks to stop the cooking. They will be very soft and fragile at first, but will firm up when cool. Let cool to warm, at least 10 minutes, before devouring. Absolutely amazing cookies! I originally made them for my daughter who has Celiac, but they were so delicious I made a second batch for my husband and me, even though we don’t need to follow a gf diet. Thanks so much for this recipe! So glad you love them. Alanna is such a talented baker. Thanks for trying them out!